"Zune® is partnering with Best Buy to showcase the new Zune HD portable digital media player that will be releasing this Fall. Zune Reps will be in select Best Buy stores on August 22 and 23 demoing Zune HD and answering customer questions. This event will be the first time the Zune HD will be demonstrated in store for public viewing, so come by and check it out!" Circle the date on your calendars! August 22 & 23 will be your first opportunity to check out a Zune HD in the flesh. Or I guess in the metal and silicon. The Zune HD is a pretty huge step for the Zune line. After three years of only one significant change in form, we're really going to see a huge step forward with the HD. Aside from the slim form factor, the beautiful screen on the HD looks to be pretty incredible. This should be some good publicity having an in-store demo at Best Buy. I know from talking to people that there is still a very negative perception of the Zune that the first design caused. Its a shame since the current models are very nice themselves. I know I love my Zune 80! 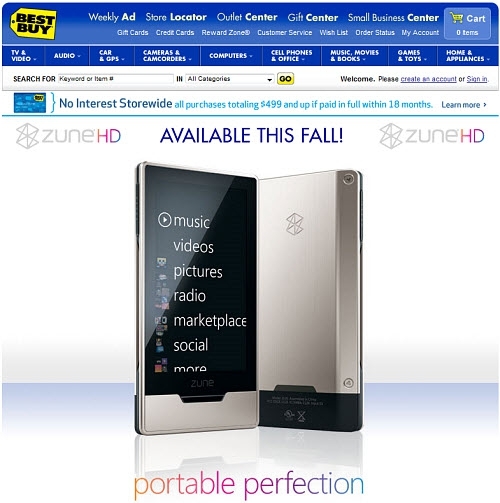 So remember, if you want to see the Zune HD before it launches, get out to Best Buy next weekend.